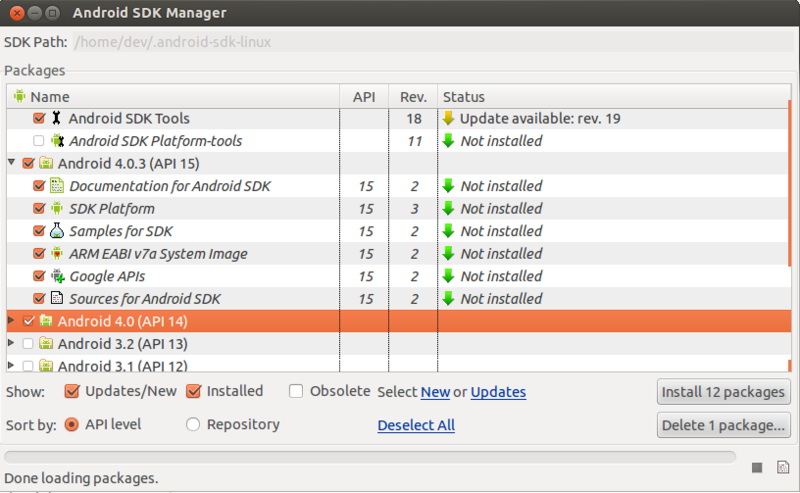 Download and unpack the Android SDK, move it to your home folder. I prefer to set a point in front of the directory folder to make it be hidden so that my home directoy still looks tidy: .android-sdk-linux. And add it to your .bashrc-file so that this path is loaded automatically when you log on. After that you have to install eclipse (so you even get the latest java development kit jdk). Android people recommend to install in that order. If you install eclipse before adt, you maybe don’t find adt in eclipse, as I did. To solve this, uninstall eclipse and remove the folders ~/.eclipse and ~/workspace. Then install eclipse again and add adt to eclipse. Want to have your web apps as native android apps, see the PhoneGap. A real world example could be wikipedia mobile.